How true! With the bright sun the shadows have been so dark and crisp. A field-day for shadow chasers! This past week I was taking an art course at a lovely site. There were so many beautiful buildings and gardens. I spent a bit of time chasing shadows! The basketball net made interesting shadows and I caught them at different times of the day. I loved the sculpture of this post and the shadow was just as lovely. Be sure to check out the other great shadow chasers at Hey Harriet!, a fabulous meme created by Tracy. Her mosaics of weekly shadows is worth the visit! Today it is time to share our love of flowers, especially with a macro view. There is so much beauty to behold around us at this time. Here are several flowers for your enjoyment. I had to share another bloom of this beautiful stargazer lily! 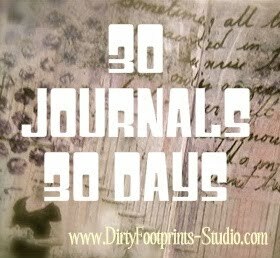 30 Journals in 30 Days + Mine! Connie of Dirty Footprints Studio has been holding the " 30 JOURNALS 30 DAYS " project all month and today, thye last day of July, is a special celebration of journals at Dirty Footprints Studio!! As Connie says: "It doesn't matter if you're an Art Journal virgin, vixen, or veteran--your experience with Art Journaling is valid" and she asks everyone to share their journaling experience. To be part of the project, post your interview on your blog and post it here. How long have you been Art Journaling? 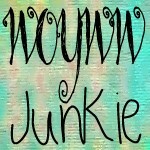 I really only began art journaling a little over a year ago, about the same time I started my blog. I had kept diaries and journals as a teen, but did not add artwork. I was more focused on the words. 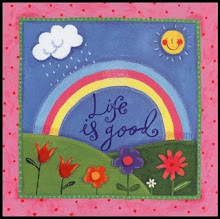 How has Art Journaling impacted, changed, or enhanced your life? 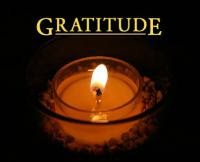 or in response to challenges, has enabled me to use pictures to respond to questions or prompts. The saying "A picture is worth a thousand words" is so true. Adding art and collage has really made journaling more fun as well. What are a few of your favorite Art Journaling materials? I use a lot of found materials for collage; magazines, sharpie markers, watercolour pencils, acrylic paints, hand -made painted papers. Who are some of your favorite Art Journalers? 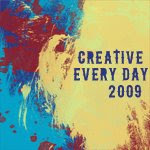 My first experience with an art journaler was with Leah of "Creative Every Day". 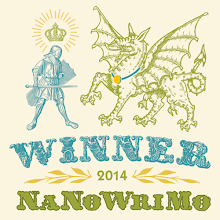 Since then I have come across so many wonderful journalers. 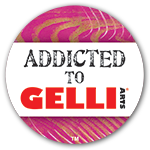 Leah Piken Kolidas of "Creative Every Day"
Jamie Ridler of "Jamie Ridler Studios"
Kathryn Antyr of "TrueNorth/Collage Diva"
Elizabeth Golden of "The Last Door Down the Hall "
Lis of "Dandelion Seeds and Dreams"
Connie of "Dirty Footprints Studio"! There are so many awesome journalers and artists that it would be impossible to include everyone. Connie will be listing many other journalers and it will be wonderful to have that resource on her blog. What kind words of encouragement would you say to an Art Journal newbie? There is no right or wrong to journaling - it is all your own thing! There are videos to watch on youtube and books to read and blogs to visit - there is no end to the resources available. Where can we contact you...give us some link LOVE!! I have been teaching elementary school for 30 years. I love teaching, especially art. I will be returning to Grade 3 next year and could retire in a year or two. What's next? Hopefully, teaching art to children! In the past 2 years, since my mother died, I have really tried to add as much art and creativity to my life. It has been quite a learning curve! I have taken many art courses over the years, but I've not taken any formal training. Taking online courses has been new and I've now done several - ones with Connie and CollageDiva for example. Taking part in challenges and working on my own art projects has been fun as well. The whole blogging community is a very supportive one. Time for Weekend Reflections once again - a time to search out reflections where ever they may appear. Windows,lakes and streams, puddles, raindrops. mirrors are all possibilities! Visiting Stratford is always enjoyable. Walking along the Avon River is a must, as swans and geese and ducks can always be found in and around the shore. There was also some interesting non-living things in the water as well! Be sure the visit the other great participants here. 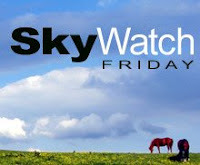 It is Sky Watch Friday and what a week for skies and clouds! This week the skies have been so changeable. The blues of hot weather have been replaced with great cloud variety. Be sure to visit the other wonderful sky watchers here. How do you wish to nourish your self? I had hoped that once summer began I would begin a routine that would truly help to improve my health. I know what I should do - eat healthy, exercise, drink water. It is in the practice that I falter. I need to take better care of myself. Jamie's question is a gentle nudge - but by posing the question differently, it has me realize that I really haven't been nourishing myself. Trying to firm up my willpower and getting upset when I don't follow through, is another spiral down. Nourishing my soul, nourishing my body are very different goals than trying to be healthy! I say an add that said "Nourish to flourish" - what a great description! I want to nourish my body by putting in it healthy foods and water, by dancing, by swimming, by walking and by treating it with respect. I want to nourish my soul by being creative, by meditating, praying and reading. To nourish is to give life to and I so want to give life to me! Lately I have been caught up in thinking negative thoughts and focusing on pain. I want to turn from that negativity, once and for all, and look to the positive. Be sure to visit the other wonderful wishcasters here. 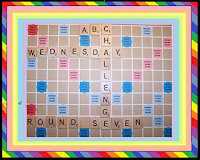 This week ABC Wednesday's letter of the week is B. Continuing with my focus on art, B is for an assortment of artists, with different styles and from very different backgrounds. William Blake (1757-1827) Blake "was an English poet, painter, and printmaker. Largely unrecognised during his lifetime, Blake is now considered a seminal figure in the history of both the poetry and visual arts of the Romantic Age." Bosch "was an Early Netherlandish painter. His work is known for its use of fantastic imagery to illustrate moral and religious concepts and narratives." Botticelli "was an Italian painter of the Florentine school during the Early Renaissance." Bruegel "was a Netherlandish Renaissance painter and printmaker known for his landscapes and peasant scenes"
brushes and brushstroke, which for an artist is essential. The brushstrokes of a painting are very distinct and can clearly identify many artists. Think Vincent Van Gogh or the Impressionists. Edgar Degas made this statement: "In a single brushstroke we can say more than a writer in a whole volume." B is also for Blots and block printing. Visit a previous post where I had fun with these 2 art forms. I continue to work on my ATCs and have been enjoying creating cards for different swaps. 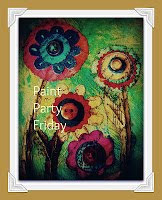 I begin an art course tomorrow on acrylics and collage and am looking forward to a very creative week. I am behind in my collage cards but hope to display them all by next Sunday. They have been fun to create as well. 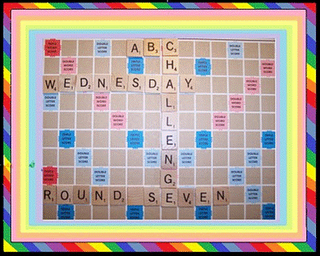 Challenges abound in blogland and I am slowly getting involved in many of them. Photography is becoming more and more a joy for me and I hope for August to complete a photo a day. There are many more challenges coming up for August! More on these next Sunday. Sunday Citar is an opportunity to share an inspiring quote and lovely art or photos. I came across this quote recently and it is so true. "It's only with the heart that one can see rightly. Once again it is time to share gorgeous flowers close-up. My gardens have been producing many lovely flowers. but one plant in particular has outdone itself! Shadow chasing time once again! Once you are bitten by the bug, you pursue where ever you are! Last week ,in the small town of Tweed, where we vacationed, shadows abounded. I will probably be sharing them for a few weeks! Throughout the town, most of the fire hydrants are painted. This one was near our motel. I couldn't resist these shadows by our motel! Across from the motel was a lovely park by the lake. Be sure to visit other great shadow chasers at Hey Harriet, a wonderful meme started by Tracy! This week, the clouds have been huge and white and billowing. With the heat last week, most times the sky was blue. With threat of thunderstorms this week, the sky has been ever changing. Sunday Weekly Wrap-Up - Including Elton!